Google underwent a long antitrust probe by the FTC where tons of testimony was heard over the course of many many months. Google has come out victorious but had to make three changes to appease the FTC. The FTC announced it on their site as did Google on their blog. (1) Give web sites the option to opt out of inclusion from specialized search results pages, such as local, travel and shopping. (2) Give advertisers an easier way to export their ad campaigns to competing search ad networks in an easier way. (3) Google will not use their Motorola patents in an anti-competitive way to block rival products. Greg Sterling has a much better write up on the topic at Search Engine Land, so I recommend you read it. 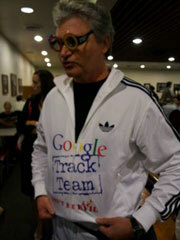 Oh, the picture here is of a Google protestor at one of the hearings. Google is very happy with the outcome and I personally think it is a fair one.